The time for change is now overdue for Hawaii's beleaguered, mismanaged, corrupt and out-of-touch Republican Party. The few brave Republican challenger candidates on ballots across Hawaii got slaughtered tonight by shocking proportions at the hands of their own party leadership. While every single GOP challenger went down in flames tonight, we also lost two Republican incumbents - State Senator Sam Slom (SD9) and State Representative Feki Pouha (HD47). Clearly, our party's leaders have no idea what they are doing. We now have fewer Republicans in state office than we did just 24 hours ago. Two years got completely wasted since 2014, with voters not having been given even one reason to pick Republicans over Democrats. The entire state and county leadership team needs to resign first thing tomorrow morning and just let the janitor run the party for a while until we sort things out. As our new president-elect Donald Trump might say, "YOU'RE FIRED!!!" In fact, our party's leadership is doing such a terrible job that known Republicans are donating big money to Democrats, incumbent Republicans are switching parties to become Democrats, Democrats have infiltrated our party leadership, and even our most celebrated challengers like Jaci Agustin, Charles Djou and Eric Ching lost by big margins considering the resources devoted by party leaders; each of them substantially underperforming against the rosy expectations we kept hearing from party headquarters. Worst of all, voters have no idea what our party is trying to sell them. The election of 2018 starts tomorrow. We can no longer fritter away money, time, opportunities for differentiation, or blown chances to earn trust and support from voters. Democrats won control of Hawaii politics in one single election 62 years ago. At the rate our piss poor party leaders are going, Republicans will never, ever, ever be on track to break even; let alone become a governing majority. Naturally, our party ran out of money before the election. Miriam Hellreich and Fritz Rohlfing and Gene Ward blew $360,000 of donor funds on overhead alone since the 2014 election, with zero going to communications or organizing. Republican donors thought they were helping our party to spread a winning message about winning policies and getting Republican candidates elected. It turns out that Hellreich, Rohlfing, Ward and the rest were just keeping our party on life support, with no intention of ever conveying to voters what was at stake in the 2016 election or even what the consequences are of having a Democrat supermajority for 62 years. Terrible party leadership regularly hands Democrats victory on a silver platter every two years. Tonight's horrible showing is exactly what you can expect when our party stands for absolutely nothing, when we stay silent for 24 months between elections, when we invest our limited donor funds into administrative overhead rather than advertising and organizing, and when we allow closet Democrats and RINO's to call the shots decade after decade. Once again, the resignations of all state and county party leaders in the Aloha State must be tendered immediately. They have no idea what they are doing and we only have two years until the next election. These misfits know who they are: Miriam Hellreich, Fritz Rohlfing, Pat Saiki, Barbara Marumoto, Larie Manutai, Andy Mukk, Boyd Ready, Bob Hickling, Jack James, Steve Yoder, and all the rest of these do-nothings. They've got to go. Not a single Democrat in Hawaii feared for his or her political job tonight because this election got thrown two years ago. Tonight we saw there was ZERO improvement in the average GOP share of votes cast. That's totally unacceptable, yet entirely predictable. Our party can, will and must change. We can no longer refuse to recognize that voters deserve a well-articulated and attractive conservative choice to Democrats. We can no longer be silent, neutral, and dysfunctional. The dismal numbers speak for themselves. HIRA's warnings went unheeded. Common sense and political knowhow got trampled. And so, another preventable political disaster hit our party tonight like a ton of bricks. 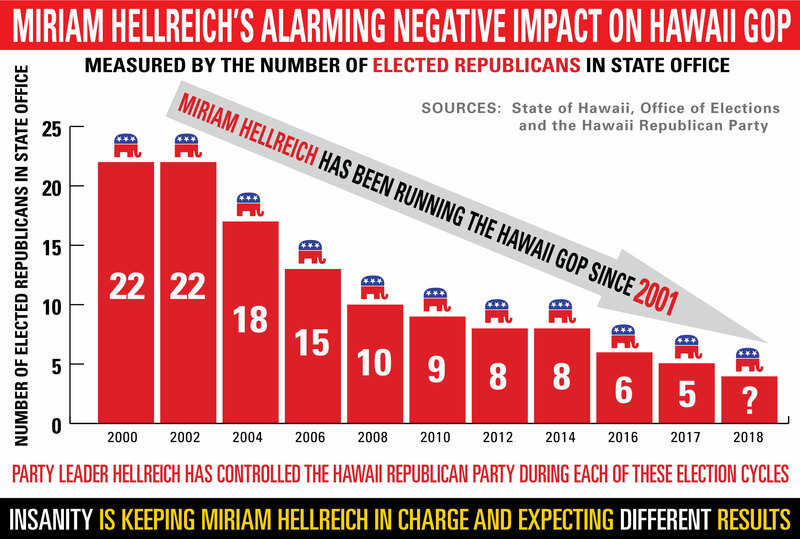 The Hellreich era at the Hawaii GOP is over. And Hellreich's minions need to pack up and leave or be thrown out in the coming weeks. Real Republicans are coming to take our party back. We won't wait until Team Hellreich turns our State House into a "zero Republican zone" like they've done the State Senate. 2018 starts tomorrow.